The people of the Haida Nation have occupied and collected food and materials from Nang Xaldangaas since time immemorial. Several Haida villages and seasonal camps exist within the heritage site/conservancy at Sa-ouchten, Yan, Astowa, Kunglelung, Tohlka, Mi-ah, Kung-oas, and Skaos. There are also two Haida Watchmen camps located on Reserves within this heritage site/conservancy; one at George Point (Skaos) and one at Seven-Mile (Wiah Point). Important foraging habitat and potential nesting habitat and can be found within this heritage site/conservancy for Northern goshawks, marbled murrelets, and common murres. Nang Xaldangaas Heritage Site/Conservancy is located on the northern tip of Graham Island, Haida Gwaii, directly west of the communities of Old Massett and Masset. It is part of an archipelago-wide system of protected areas that includes Gwaii Haanas National Park Reserve and Haida Heritage Site, several provincial parks and ecological reserves, and ten other heritage site/conservancies. In total, half of the land base of Haida Gwaii is now in protected status. The terrestrial component of the heritage site/conservancy covers 6,897 hectares. It extends from Masset Sound and Masset Harbour on Dixon Entrance, to Virago Sound and the eastern side of Naden Harbour, along a 60 kilometre stretch of Pacific Ocean coastline. The elevation range is from sea level to 91 metres. The marine component/foreshore area covers an area of 9,798 hectares. The marine foreshore area has high intertidal values and kelp forest areas which help protect unique marine ecosystems and an internationally significant intertidal estuarine wetland complex. This area is described as a critical wetland habitat for waterfowl by the B.C. Waterfowl Technical Committee. Over one thousand waterfowl have been observed in the Sturgess Bay / Maast Island wetlands during migration, as well as large flocks of shorebirds. Pacific Brant Geese were also observed at Maast Island in 1980. Other species recorded include the Western Grebe, Oldsquaw, Red-breasted Merganser, Pelagic Cormorants(red listed), and Great Blue Heron (blue listed). The Masset Sound area is recognized by the Department of Fisheries and Oceans Canada as one of the coasts’ most unique marine ecosystems. The western area of Virago Sound is dominated by warm, shallow, sandy and flat bottom with low currents and high exposure. 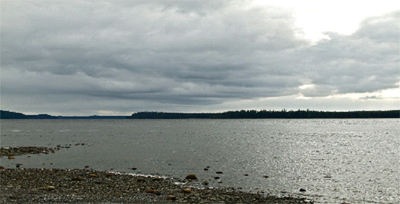 The mouth of Masset Sound is dominated by warm, shallow, sandy and flat bottom with by high current and high exposure. Masset Sound itself is dominated by warm shallow, sandy and flat bottom physiography typified by high current and low exposure. The Masset Sound shoreline is exposed to winds and wave action from the north, while further to the south, by Maast Island, the shoreline is more protected by Dixon Entrance. In a shallow narrow channel to the west of Maast Island profuse eelgrass beds form a ‘hanging lagoons’. Small spike-rush (Eleocharis parvula), which is locally rare, is found within the estuaries along Masset sound. Thirty two archaeological sites contain a number of recorded cultural values. These include at least 182 known culturally modified trees, lithics, pre-contact cultural material, fire broken rock, charcoal, shell midden, deer bone, bird bone, depression, plank house, human remains, seal and sea otter remains, tapered bark strip and rectangular bark strip. Many of these areas have not been inventoried thoroughly which indicates that the heritage site/conservancy likely contains many other unrecorded cultural heritage and archaeological sites. The management plan for Nang Xaldangaas Heritage Site/Conservancy was approved in 2011 by both BC Parks and the Haida Nation.